Scholar and author of Spanish extraction; flourished in the latter half of the sixteenth century in Greece and Asia Minor. He wrote "Meḳor Ḥayyim" (3 vols., Smyrna, n.d.), an ethical work in Judæo-Spanish. Spanish physician and poet; born at Fez; died in Amsterdam April 1, 1622. At one time he held the position of rabbi at Oran; but late in life he left that city to settle in Amsterdam, where he opened a Talmudical school which counted among its pupils Manasseh ben Israel. Dissatisfied with the laxity in religious matters which he noticed among many members of the Sephardic community, Uziel delivered a series of lectures which led to the foundation of a new congregation under the name of "Neweh Shalom." In 1610, at the death of Judah Vega, the first rabbi of the new congregation, Uziel was called to the rabbinate. 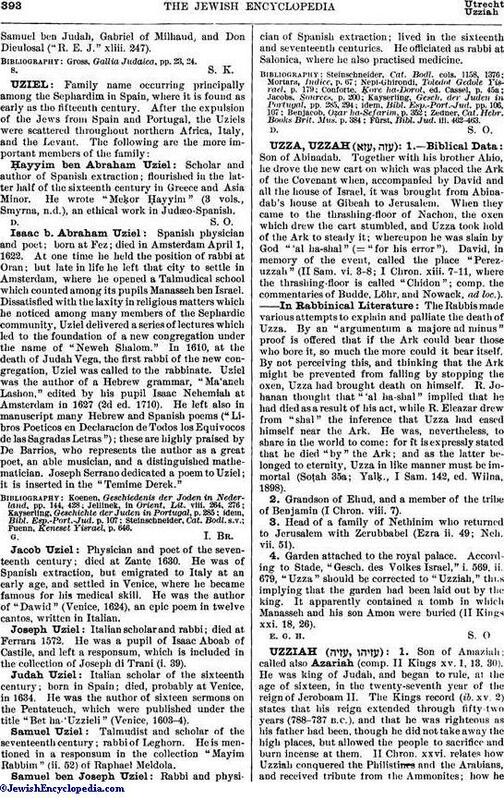 Uziel was the author of a Hebrew grammar, "Ma'aneh Lashon," edited by his pupil Isaac Nehemiah at Amsterdam in 1627 (2d ed. 1710). He left also in manuscript many Hebrew and Spanish poems ("Libros Poeticos en Declaracion de Todos los Equivocos de las Sagradas Letras"); these are highly praised by De Barrios, who represents the author as a great poet, an able musician, and a distinguished mathematician. Joseph Serrano dedicated a poem to Uziel; it is inserted in the "Temime Derek." Fuenn, Keneset Yisrael, p. 646. Physician and poet of the seventeenth century; died at Zante 1630. He was of Spanish extraction, but emigrated to Italy at an early age, and settled in Venice, where he became famous for his medical skill. He was the author of "Dawid" (Venice, 1624), an epic poem in twelve cantos, written in Italian. Italian scholar and rabbi; died at Ferrara 1572. He was a pupil of Isaac Aboab of Castile, and left a responsum, which is included in the collection of Joseph di Trani (i. 39). Italian scholar of the sixteenth century; born in Spain; died, probably at Venice, in 1634. He was the author of sixteen sermons on the Pentateuch, which were published under the title "Bet ha-'Uzzieli" (Venice, 1603-4). Talmudist and scholar of the seventeenth century; rabbi of Leghorn. He is mentioned in a responsum in the collection "Mayim Rabbim" (ii. 52) of Raphael Meldola. Rabbi and physician of Spanish extraction; lived in the sixteenth and seventeenth centuries. He officiated as rabbi at Salonica, where he also practised medicine. Fürst, Bibl. Jud. iii. 462-463.